The green Hualapai Mountains are a cool and refreshing sight in contrast to Kingman and the neighboring mountain ranges. These are the highest mountains in northwestern Arizona and you'll find tall ponderosa pines near the top. Hualapai Peak towers above the surrounding desert at 8,417 feet. 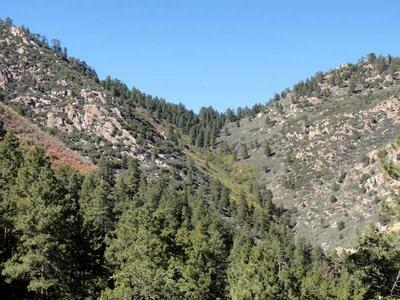 Hualapai Mountain County Park has hiking trails, ATV trails, a campground, and cabins. The mountain scenery is gorgeous on this sky island oasis. Campsites: There are countless camping possibilities here on BLM land surrounding the mountains. 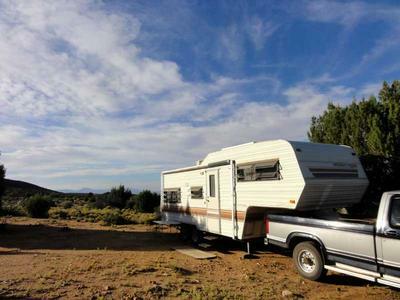 Pay camping can be found in Hualapai Mountain County Park by heading up Hualapai Mountain Road from Kingman. I've been camping in the mountain foothills for nearly 2 weeks now. I’m camped off an old highway that is now a primitive BLM road. I found an old Coca-Cola can along the road and there are probably more artifacts from that era when the highway was in use. Recreation: Exploring the Hualapai Mountains is the thing to do here. You can explore them by car, jeep, OHV, mountain bike, or on foot. There are numerous primitive BLM roads that snake up into the mountains, and many become so treacherous that hiking is the best means of navigating them. Exploring the washes and canyons is great fun too. There are many waterfalls (dry unless there's rain) that are fascinating. The numerous granite outcrops are lovely. 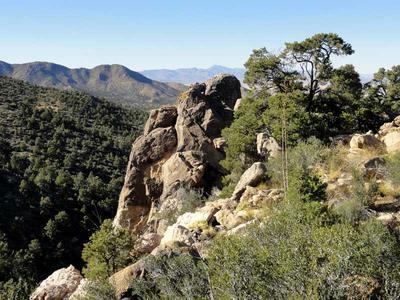 There are some trails at Hualapai Mountain County Park, including one that reaches the highest point, Hualapai Peak. Weather: I had several days in the 80s when I first arrived. Lows were in the 50s. On a few days it only warmed up to the 60s. Lows dropped a bit below 40. It’s warming up now to 70s for highs, 40s for lows. This is a breezy place. I had one moment when it was dead calm, otherwise the wind has been blowing. Thankfully the wind hasn’t been real strong; just a few days with 20-30 mph gusts. I’ve had mostly all sunny days. There were 2 storm systems that brought clouds, but no rain. Wildlife: I saw 2 mule deer while biking up Antelope Wash Road. 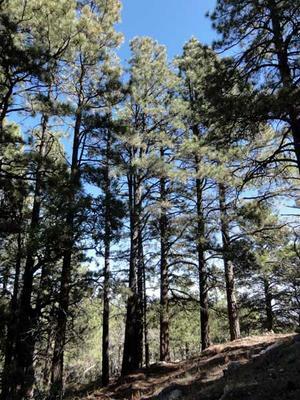 I saw them between 6,000 and 6,500 feet where there are tall ponderosa pines. I’ve also seen several jack rabbits, a few ground squirrels, small lizards, humming birds, ravens, turkey vultures, a few hawks, gambel's quail, northern flickers, western scrub jays, and several other birds. Insects: No problems, just a few small flies. I’ve seen a few bees here and there, butterflies, and some leaf footed bugs. RV Solar: Lots of sun here. The juniper trees are short and there’s no problem with them shading my RV’s roof. RV Campsite Rating: 7 out of 10. If there was less wind this site would get an 8. It’s far enough from town to keep it nice and quiet...except when hunting season begins, then traffic increases times 20. It's late October as I'm writing this and the hunters have arrived.